Betty, I Think It’s Time That You and I Had a Little Talk…And Key Lime Pie Cupcakes! Welcome to Breaking Up With Betty Crocker! A year ago, I would have never believed this blog would exist. Don’t get me wrong, I’ve adored baking since I was tall enough to see over the countertop in my mother’s kitchen and help her mix up the latest recipe she had found. As I grew up, I developed my mother’s passion for baking delicious things for people I love. As those who know me will tell you, I like making people happy and I like baking delicious things; and it just so happens that those two things oftentimes go hand in hand. And yet despite this love of baking, I was a bit afraid to break out of the box. Quite literally. I was good at making cookies from scratch, I had been baking cookies for ages. But cakes, breads, and in general anything with yeast on the ingredient list or a merangue in the instructions sent me running toward the oh-so-convenient boxed mixes. There was an intimidation factor that I couldn’t seem to overcome and I simply could not break up with Betty Crocker. That was, until I found the perfect cupcake. I was perusing cooking blogs looking for my next cooking adventure, when I stumbled upon these spectacular Key Lime Pie Cupcakes from Annie’s Eats. I love a good key lime dessert, it makes even the grayest days feel like summertime, so I decided to take up a new challenge: homemade cupcakes AND a key lime curd filling. Not being familiar with curd-making, this was going to be a bit of an experiment. To my surprise, the key lime cupcake came together quickly. The graham cracker crust was a fun addition to the pie themed cupcake, and the cake batter itself is a fairly simple concoction. I wanted a little more lime flavor in my cupcakes, so I added a bit of fresh lime juice from the limes I’d zested. In the end, I thought it added a bit more flavor, and made up for the fact that I couldn’t find the coconut extract the recipe initially called for (Next time I’ll have to plan ahead a bit more and go to the specialty cooking store. My local grocer does not have coconut extract in stock). The next and biggest challenge was the key lime curd filling. As with most things that require careful monitoring of heat as to not scald or burn the ingredients (in this case, cook the eggs), the process made me very nervous. Not much help was the fact that the burner on my gas stove kept going out. Nonetheless, with a lot of gentle whisking and some patience, the curd came together nicely (so nicely, in fact, that the extra curd that didn’t make it into the cupcakes made its way onto several pieces of toast in the days following). A word of warning (which Annie mentions on her blog and I will wholeheartedly agree with): the curd is not necessarily a thick filling, so it can be a bit messy to eat sans fork. I’m told(by a few lucky friends and coworkers) that nibbling at the cupcake little by little to get little tastes of everything a little at a time works OR you can attempt to eat it in a few bites before it has a chance to fall apart on you… The choice is yours. Preheat the oven to 350 degrees. Line a cupcake pan with paper liners. To make the graham cracker crust, combine the graham cracker crumbs, sugar and melted butter in a small mixing bowl and mix well with a fork until all crumbs are moistened and the mixture is crumbly. Place about 1 tablespoon of the mixture into the bottom of each cupcake liner and press down to line the bottom (I used the bottom of a narrow drinking glass, but a squeeze bottle or a shot glass works well too.) Bake for 5 minutes. Remove from the oven and maintain the oven temperature. To make the cupcakes, combine the cake flour, baking powder and salt in a medium bowl. Whisk together and set aside. Add the butter to the bowl of an electric mixer fitted with a paddle attachment. Beat on medium-high speed for 3 minutes until light and creamy in color. Scrape down the sides of the bowl and beat for one more minute. Beat in the lime zest. Add the sugar to the butter mixture, 1/4 cup at a time, beating 1 minute after each addition. Mix in the eggs one at a time until incorporated. Scrape down the sides of the bowl after each addition. Combine the buttermilk and the vanilla and coconut extracts in a liquid measuring cup. With the mixer set on low speed, add the dry ingredients alternately with the wet ingredients, beginning and ending with the dry ingredients and mixing just until incorporated. Scrape down the sides of the bowl, add the lime juice if desired and mix for 15 seconds longer. Divide the batter between the prepared paper liners, filling each about 2/3 of the way full (I use a large cookie scoop to do this, it makes scooping and evenly dividing the batter much easier). Bake 18-22 minutes, or until a toothpick inserted into the center comes out clean. Allow to cool in the pan for 5-10 minutes before transferring to a cooling rack to cool completely. Once the cupcakes and the curd are cooled, use a paring knife to cut a well in the center of each cupcake. Be sure not to cut too deeply, you still want some cake left at the bottom. Discard the cake scraps and fill each well with about 1 1/2 tablespoons of the lime curd. To make the whipped cream topping, combine heavy cream and confectioners’ sugar in the bowl of an electric mixer fitted with the whisk attachment. Whip on medium-high speed until stiff peaks form. Blend in the vanilla. Transfer the whipped cream to a pastry bag fitted with a decorative tip. 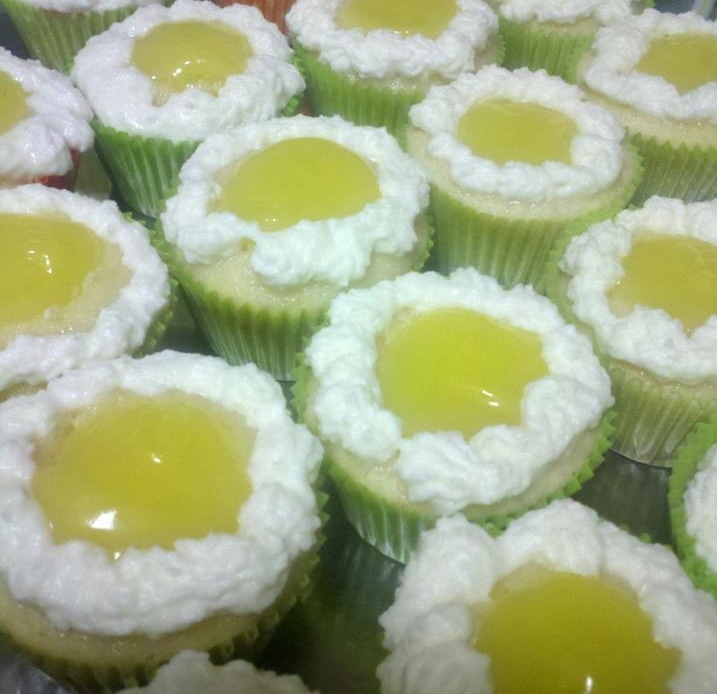 Pipe a rim of whipped cream around the tops of each cupcake, leaving the lime curd exposed in the center. Garnish with extra key lime slices if desired. This entry was posted in Cupcakes, Curds, Fillings, Uncategorized and tagged Key Lime Pie, Welcome to the Blog by Ashley. Bookmark the permalink. LOOKS GODD TOO BAD THEY DON’T SHIP WELL.